New Braunfels is an historic Texas town founded in the early 1800’s by German settlers from Braunfels, Germany. The city’s German roots are still present today particularly during the annual Octoberfest celebration, Wurstfest. Wurstfest attracts several hundred thousand people from around the world for German food, beer, music and dancing. The city is growing rapidly, adding over 21,000 new residents in the past ten years alone. Its popularity stems from several factors. 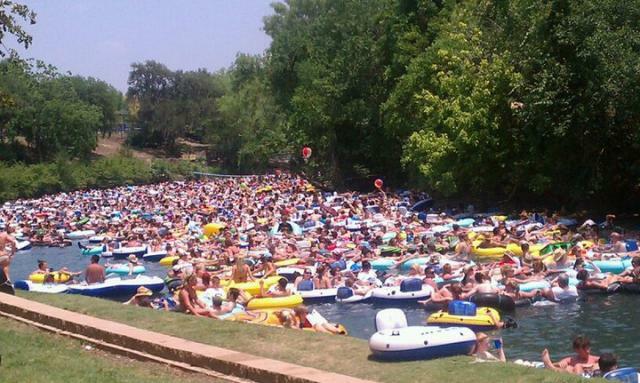 New Braunfels is home to Schlitterbahn, the world’s #1 waterpark according to the Travel Channel. Two beautiful rivers, the Guadalupe and Comal, lure countless tourists for tubing and rafting activities. It is conveniently located midway between Austin and San Antonio on the IH-35 corridor, putting it in close promimity to many major Texas attractions. The world’s largest outlet shopping complex is less than ten miles away in San Marcos. Canyon Lake and the Texas Hill Country are minutes away, and attractions in San Antonio and Austin are a short drive. Basically, almost all of Texas’ top tourist attractions are located within 45 minutes of New Braunfels. There is a wide array of excellent restaurants in New Braunfels for every taste and pocket book. Rudy’s and Cooper’s both serve nationally renowned barbeque (just ask the New York Times). They are extremely popular among tourists and locals alike. Also take a look at the Gristmill, Gruene River Grill, The Gruene Door, River Tea House, Myron’s Steakhouse, and McAdoo’s Seafood for exceptional dining experiences. If you are looking for a truly exceptional place to live, New Braunfels is just the place to call home. For information on real estate sales, rentals, or investment property in the area, contact Ted Omohundro at (830) 708-7710.